A thoroughly compelling rags-to-riches story, Cinderella has inspired countless films, ballets, books, and songs. The earliest type of Cinderella story dates as far back as the ancient Greeks, and the account by Strabo in the 1st century BCE. In that story, a large eagle drops a beautiful sandal into the lap of a king, who searches the lands until he finds the woman to whom it belongs. The Chinese version from 860 involves a magical fish, but also has the crucial lost slipper element. The first Italian version, Cenerentola, was published in 1634, followed by Charles Perault’s in 1697, which first introduces the glass slippers. The Brothers Grimm didn’t write their version, “Aschenputtel”, until the 19th century, in which the fairy godmother is actually a magical tree. Like so many of the older stories, the Disney version of this classic tale involves crucial help from animals, most notably mice. 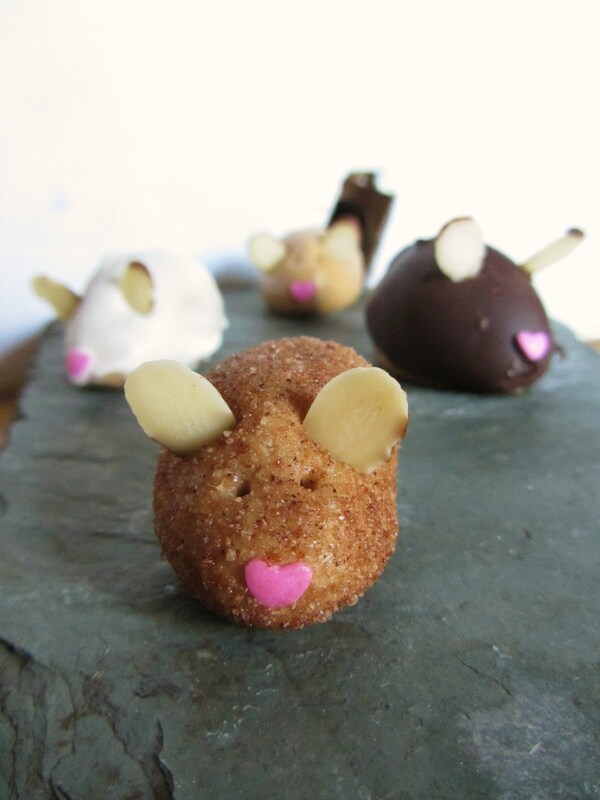 These peanut butter mice are so gobbleable that they won’t last long! Mix the peanut butter, dry milk, and honey together in a medium mixing bowl. Roll into small balls, about the size of a large marble, then pinch into teardrop shapes. At this point, either leave them plain, or roll in cinnamon sugar. Press a sprinkle onto the point of the teardrop for a nose, then insert two almond slices for ears. Make the eyes with a toothpick. You may also press the shape of a curling tail into the back of the mouse using a toothpick. To cover with chocolate, place the plain balls in the refrigerator for at least an hour to chill. Line a baking sheet with wax paper. Melt the chocolate in a small bowl in the microwave, then nestle it in a slightly larger bowl filled with hot water. Remove the mice from the fridge, and dip them one at a time in the chocolate, allow the excess to drip off, then place them on the wax paper. Before the chocolate sets, add the nose and ears, using a knife to make a small hole for the ears in the chilled peanut butter, if necessary. Once the chocolate is set, gently poke holes for eyes with a toothpick, and if you like, drizzle a little extra chocolate on the back for a tail.